is to become who you truly are." I have travelled to Singapore for many years. The first time I went back as an adult was in 1988, I remember this year because it was the Bi-Centenary year of Australia, there were celebrations all year long and for me going to Singapore, Malaysia and the island of Borneo was a trip of a lifetime I will always remember. Time to start a Tarot Book page on this webiste to record all the updates with creating this book. Latest news on the book, it is currently in the hands of the Editors being laid out with the correct fonts and all the pictures in place, etc. Then I will have many chances to look and comment on the layout before it goes to a full print. I am also now working on the Book Launch. Where to have the event, people to invite and creating the invitations. OMG so many things to work out and prepare. I am amazed how I went from working on the book mode to Book Launch and time to celebrate it mode. without arriving at an answer." -Gary Zukav, Author, The Seat of the Soul. 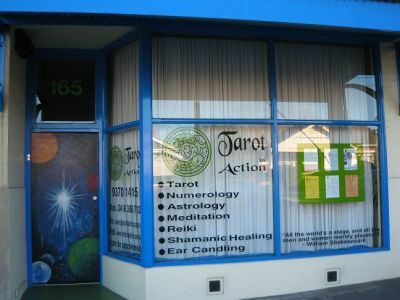 Private one to one Tarot readings and psychic consultations are available from my shop in Moonee Ponds. It is recommended to book well in advance with me because I may be booked out already. I use my shop to do readings, classes and healings. I do work every day of the week including weekends, we just need to work out a day and time that suits us both best. that is when the light gets in." Tarot Video Classes **Available NOW!! I now have made available my entire comprehensive beginners Tarot program on video. Yes I have filmed an entire 6 month program with permission of those in the 2011 class. The experience I wanted to convey in these videos is that you feel like you are part of this class. It's as if the students in the video are asking the questions like you were asking the questions yourself. After teaching Tarot since 1995 the questions are pretty much the same today. Having 22 videos and over 40 hours to work through you can imagine how many questions arise and we work through all of them. I am healing and becoming whole. I am gaining wisdom and learning compassion." I also offer one to one Tarot Counseling for those that need to go a bit deeper, rectify or clear out beliefs that are no longer supporting you or holding you back in your life today. I use Tarot cards to venture down into the unconscious to discover what is in your shadow. My Shamanic healing practices also come through as remedies to assist you with creating new healthy habits to get your life on track. Together we can look behind the mask of fear and turn it into your most powerful ally. or what we did for a living. God wants to know who we are. - it is our true life's work." For those that would like to just practice doing Tarot readings and sharing various spreads with others, this afternoon workshop is for you. I have often been asked if I run these types of classes and after so many requests I have decided to run them again. Meet others that also have some expertise in Tarot and also learn from them. when you look inside you awaken." Tarot is a tool that may assist us when we are at a crossroad in our life. As far back as the Egyptians, the Tarot was known as 'The Royal Road of Life'. This refers to important milestones that mark special or significant events along our life's journey.